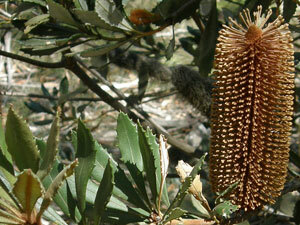 From the outset let me declare that my favourite wildflower is Old Man Banksia (Banksia serrata). No qualifications - no ifs, no buts. I adore the gnarled bark, the tactile new growth and the magnificent flower cones. Its phoenix-like regrowth after fire is inspiring. 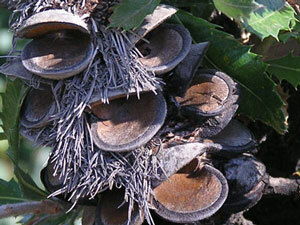 Its open or closed seed capsules indicate how long it's been since the last bushfire. My second favourite wildflowers are those that I have most recently found. Since I now have over 230 Blue Mountains wildflower species on my website, the new wildflowers I find are uncommon. Well, uncommon to me. I was taken out to a swamp on Newnes Plateau by Ian Brown to capture this threatened species. It is classed as "vulnerable" and is restricted to the Blue Mountains & Kanangra-Boyd area. 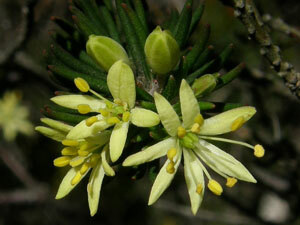 Leionema lachnaeoides - also a member of the Rutaceae family. I found this delightful plant on a side track on Narrow Neck. There is an excitement when you think you have found a plant you don't already have in your digital collection. 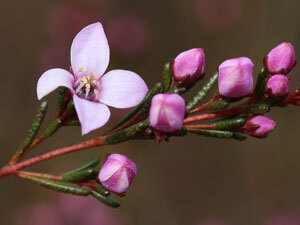 Leionema lachnaeoides is an endangered plant that is only found in exposed areas of the upper Blue Mountains. I am always a bit disappointed when I find such a special species and learn that it doesn't have a common name. Maybe it's my inability to remember botanical plant names, or that it isn't well known and hasn't therefore been "popularised". 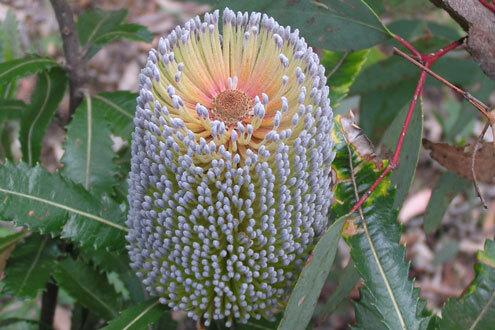 I was on a quest to collect all nine banksias that are native to the Blue Mountains, and sought the advice of Julie from the Lithgow Environment Group on where I might find the ninth - the Newnes Plateau Banksia (Banksia penicillata). Her directions were good, and I was able to spend a bit of time admiring, photographing and talking to this beautiful plant. There were only 2 adult plants plus a baby. They had been spared from the wholesale clearing nearby, simply because they were on the edge of the road. I sense that Newnes could recover from its brutal destruction if left alone for several decades. 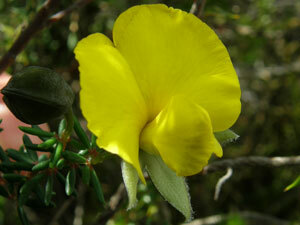 There's a Wedge Pea (Gompholobium sp.) out at Mt. Hay that neither I nor the Royal Botanic Garden botanists have yet been able to identify. There's 11 species of Gompholobium in NSW - 10 of which can be found in the Blue Mountains - and this doesn't match any of these. Yes, it may be a hybrid. I will be out at Mt. Hay in late Spring to take more photos and to study this wildflower more closely, with a view of submitting more material to those wonderful people at the Royal Botanic Garden. My third favourite wildflowers are those that I never get tired of and fill me with joy, warmth and wonder. 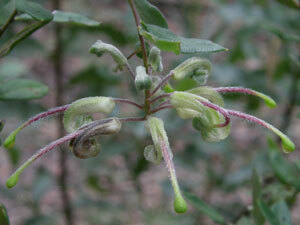 The Green Spider Flower (Grevillea mucronulata). After all these years I will still stop and admire the way it hangs poised like a spider. Being green, they're hard to see. Like many who search for wildflowers, I tend to look for splashes of white, red and yellow. But once you find a patch of them – oh my! The flaky bark of the Narrow-leaved Geebung (Persoonia linearis) and Broad-leaved Geebung (Persoonia levis). 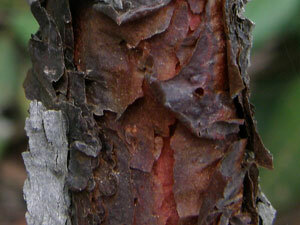 You are presented with a full palette of reds, blacks and browns in flaky paper bark. The bark also identifies them. 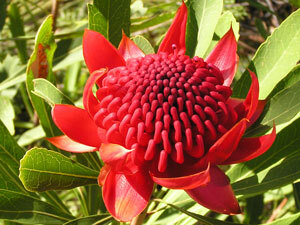 Can you imagine the Blue Mountains in spring without Waratahs (Telopea speciosissima)? Seeing the crimson flash of colour in the distance. Telopea – from the Greek “telopos”, seen from afar. On a walk last year out to Hanging Rock and Baltzer Lookout, I stopped and counted no less than 80 Waratah flower-heads in a 360 degree sweep. (See Christine Davies Waratah story). Just looking back, I notice that most of the wildflowers mentioned belong to the Family Proteaceae. That's no surprise as that family strongly resonates with me. No list of Blue Mountains flora would be complete without at least one Eucalypt - of which there are over 90 species in the Greater Blue Mountains. After all it is this genus that was primarily responsible for the Greater Blue Mountains being declared a World Heritage area. The Greater Blue Mountains Area consists of 1.03 million ha of sandstone plateaux, escarpments and gorges dominated by temperate eucalypt forest. The site, comprised of eight protected areas, is noted for its representation of the evolutionary adaptation and diversification of the eucalypts in post-Gondwana isolation on the Australian continent. Ninety-one eucalypt taxa occur within the Greater Blue Mountains Area which is also outstanding for its exceptional expression of the structural and ecological diversity of the eucalypts associated with its wide range of habitats. Although tempting to include all eucalypt species in my group of flora in third place, I have chosen as their representative the magnificent Blue Mountains Ash (Eucalyptus oreades). It should also be remembered that eucalypts put the “blue” in Blue Mountains.